Fall Weekend 2018 started with a great parade, followed by “the drive” as the HF-L football team topped UPrep and then, on Sunday October 14, the 22nd annual running of the Youth Trophy Cup Runs. 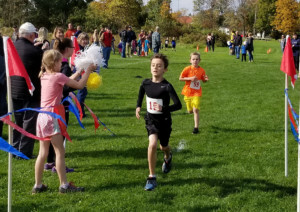 There was a buzz in the brisk but beautiful Sunday fall afternoon as kids between ages 4-12 got ready to run their race at various distances around the HF-L campus. Each race was from .264 miles to .859 miles and racers came to the finish with huge smiles and enormous enthusiasm. At the finish line, parents, siblings and friends carrying large smiles welcomed each finisher with a congratulations and hug. For the day, a couple of records were set and a couple other records narrowly missed as 87 racers crossed the line. 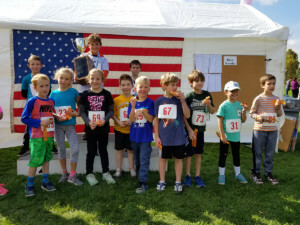 In the seven-year-old boys and girls race, Micah Bramble’s time of 3:11 bettered the previous record held by Linden Bellizzi of 3:14, which was set in 2016. In the exciting 8 year old boys and girls race both the first and second place finishers topped the course record set seven years ago of 3:11 by Joshua Vogt. The second place finisher, Liam Dailor ran a 3:09.82, and then, the now 8-year-old record holder, Reed Woodruff, edged out Dailor with a 3:07:57 course record. Many members of the National Honor Society in both grades 11 and 12, among others, came out and volunteered their time, which helped make a great event even better. Runners immensely welcomed the waters, apple, balloons and doughnuts, donated by the Honeoye Falls Market-Place. Numerous sheet pizzas, provided by Salvatore’s Old Fashioned Pizzeria, were an especially tasty snack and appeared many times in runner’s hands at their respective awards ceremony. Other event sponsors are the local office of Edward Jones, M&T Bank and Molye. Following are the results: 5-Year-Old Boys and Girls Race (.264 mile distance): 1) Greta Goodberlet 1:49, 2) Colden Campbell 1:58, 3) Maddox Bramble 2:04.4, 4) Juliet Grethel 2:04.6, 5) CJ Gray 2:06 and other finishers were Jose Vasile, Owen Darcy, Cooper Mallaber, Alexander Conrad, Declan Coyne, Amelia Wilson, Kylie Mavige, Lee Woodruff, Harper Swan, Lora Didonno, Nolan Stryker, Wyatt Love, William Harris, Madilyn Armstrong, Ella Parmele and Natalie Gelb; 6-Year-Old Boys and Girls Race (.264 mile distance): 1) Evan Mason 1:44.0, 2) Collin Bellizzi 1:51.0, 3) Noah Gauck 1:51.3, 4) Charlie Marasco 1:52.7, 5) Brayden Mallaber 1:53.5 and other finishers were Cody Swan, Kamden Pratt, Evan Khona, Arabella Grethel, Trystin Hildreth, Jack Hildreth, Jack Borgesen, Beatrice Corey, Ava Didonno, Alyssa Gilbert, Benjamin Mossow, Autum Carpenter, Avery Pude, Finley Hulsey and Julia Gilbert; 7-Year-Old Boys and Girls Race (.521 mile distance): 1) Micah Bramble course record 3:11, 2) Breck Master 3:18, 3) Collin Bellizzi 3:22, 4) Mackinley Buckley 3:26, 5) Vivian Marshall 3:37 and other finishers were Calvin Webster, Raiden Knox, Jacob Stryker, Braxton Staples, Austin Hildreth, Jane Hershaw, Heather Parham and Chase Carpenter; 8-Year-Old Boys and Girls Race (.521 mile distance): 1) Reed Woodruff course record 3:07.57, 2) Liam Dailor 3:09.82, 3) Henry Harris 3:26, 4) Lauren Burke 3:35, 5) Luke Washburn 3:39 and other finishers were Brooklyn Masters, Charlotte Hulsey, Annelise Corey, Chase McVige, Audrey Samson, Joelle Smith, Carlie Dusett, Nyla Armbruster, Abby Flagg and Jacob Moscricki; 9 and 10 Year Old Girls Race (.859 mile distance): 1) Gretchen Hulsey 5:56, 2) Adeline Beutner 6:11, 3) Kate Hulsey 6:30, 4) Lindsay Mason 6:36, 5) Elana Magorka 7:01 and 6) Sarah McLaughlin 7:13; 9 and 10 Year Old Boys Race (.859 mile distance): 1) Linden Bellizzi 5:37, 2) Andy Fosler 5:58 and 3) Nathan Conrad 6:21; 11 and 12 Year Old Girls Race (.859 mile distance): 1) Reese Dusett 5:35.4, 2) Kate Dailor 5:46, 3) Kate Brennan 6:53, 4) Erinn Camp 6:57 and 5) Paige Moscriki 7:49; and 11 and 12 Year Old Boys Race (.859 mile distance): 1) Braden Bellizzi 5:21, 2) Drew Larson 5:24, 3) Camden Hulsey 5:56 and 4) Shane Samson 5:58.